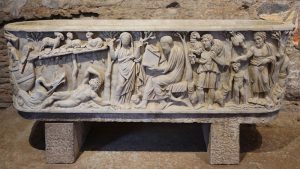 This third century sarcophagus from the Church of Santa Maria was undoubtedly made to serve as the tomb of a relatively prosperous third century Christian. As we will see below, Early Christian art borrowed many forms from pagan art. 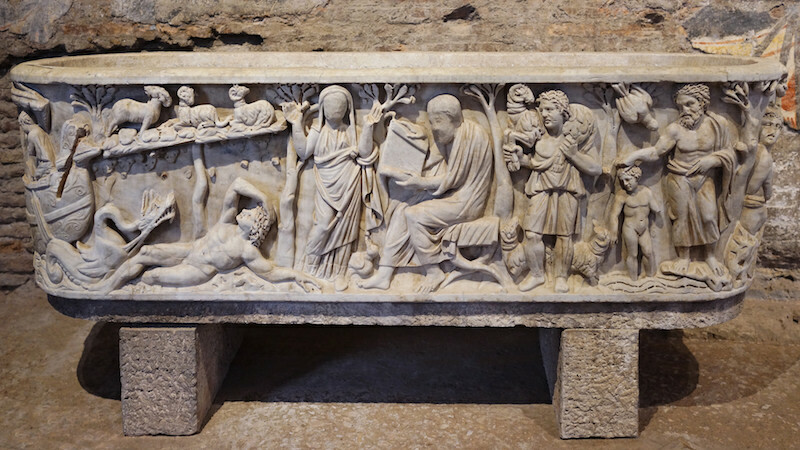 The male philosopher type that we see in the center of the Santa Maria Antiqua Sarcophagus (above) is easily identifiable with the same type in another third century sarcophagus (above), but in this case a non-Christian one. 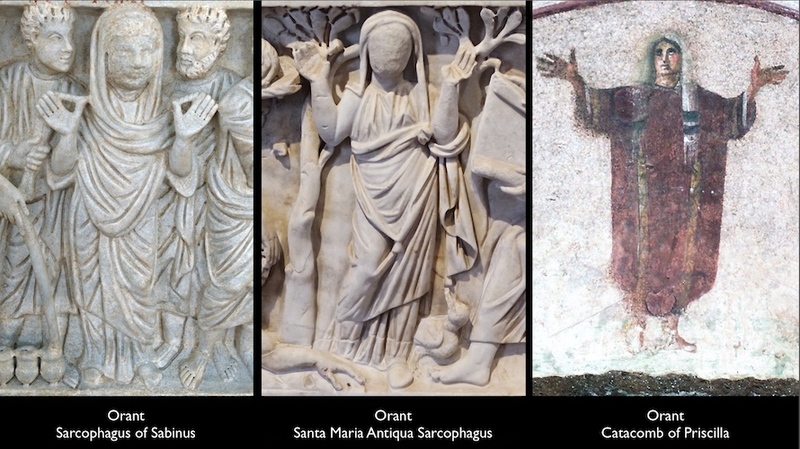 Left to right: Orant from the Sarcophagus of Sabinus, c. 310-20 (Vatican Museums); Orant from the Santa Maria Antiqua Sarcophagus, c. 270, Santa Maria Antiqua, Rome; Orant from the Catacomb of Priscilla, Rome, fresco, late 2nd century through the 4th century C.E. 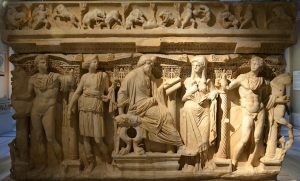 The female figure beside him in the Santa Maria Antiqua sarcophagus who holds her arms outstretched combines two different conventions. 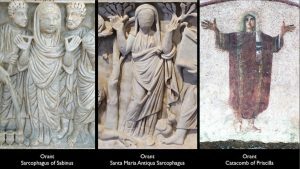 The outstretched hands in Early Christian art represent the so-called “orant” or praying figure. 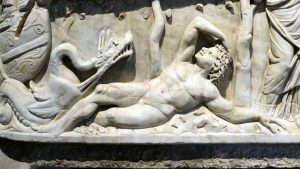 This is the same gesture found in the catacomb paintings of Jonah being vomited from the great fish, the Hebrews in the Furnace, and Daniel in the Lions den. 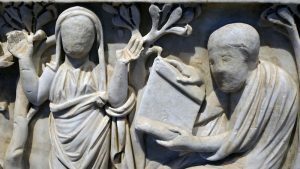 The juxtaposition of this female figure with the philosopher figure associates her with the convention of the muse in ancient Greek and Roman art (as a source of inspiration for the philosopher). 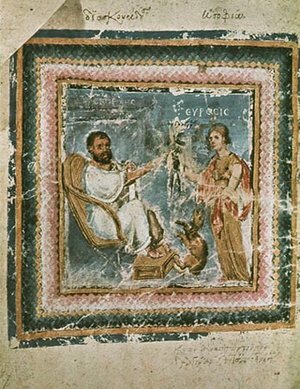 This convention is illustrated in a later sixth century miniature showing the figure of Dioscorides, an ancient Greek physician, pharmacologist, and botanist (above). 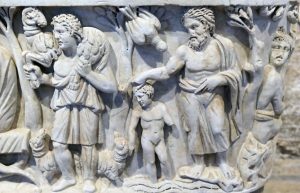 On the left side of the sarcophagus (first above), Jonah is represented sleeping under the ivy after being vomited from the great fish. The pose of the reclining Jonah with his arm over his head is based on the mythological figure of Endymion, whose wish to sleep for ever—and thus become ageless and immortal—explains the popularity of this subject on non-Christian sarcophagi (see the detail from a Roman sarcophagus – second above). 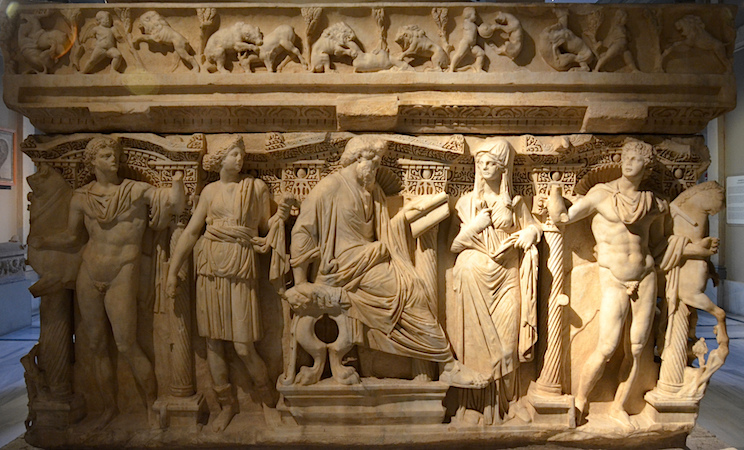 Another popular Early Christian image appears on the Santa Maria Antiqua Sarcophagus, known as the Good Shepherd. 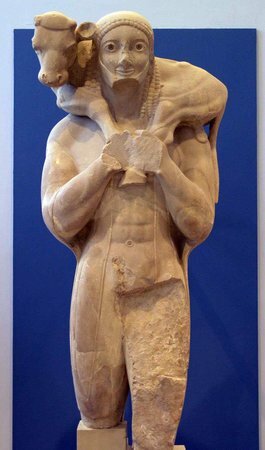 While echoing the New Testament parable of the Good Shepherd and the Psalms of David, the motif had clear parallels in Greek and Roman art, going back at least to Archaic Greek art, as exemplified by the so-called Moschophoros, or calf-bearer, from the early sixth century B.C.E. (above). 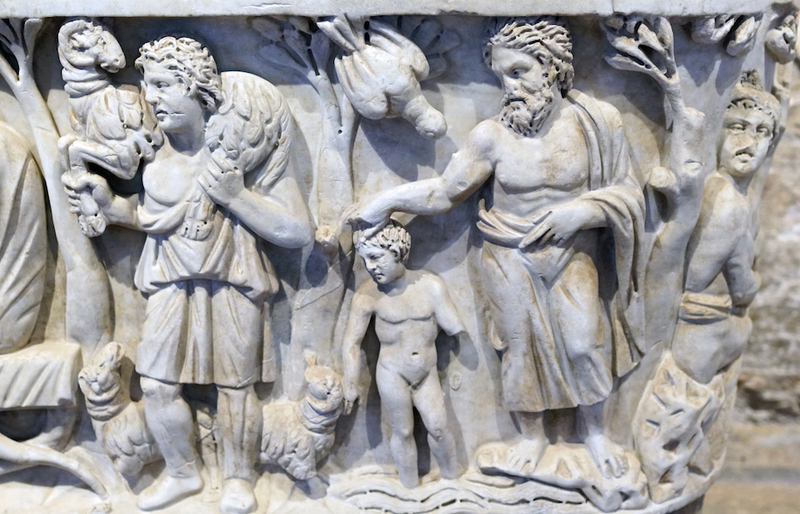 On the far right of the Santa Maria Antiqua Sarcophagus, we see an image of the Baptism of Christ (above). The inclusion of this relatively rare representation of Christ probably refers to the importance of the sacrament of Baptism, which signified death and rebirth into a new Christian life. 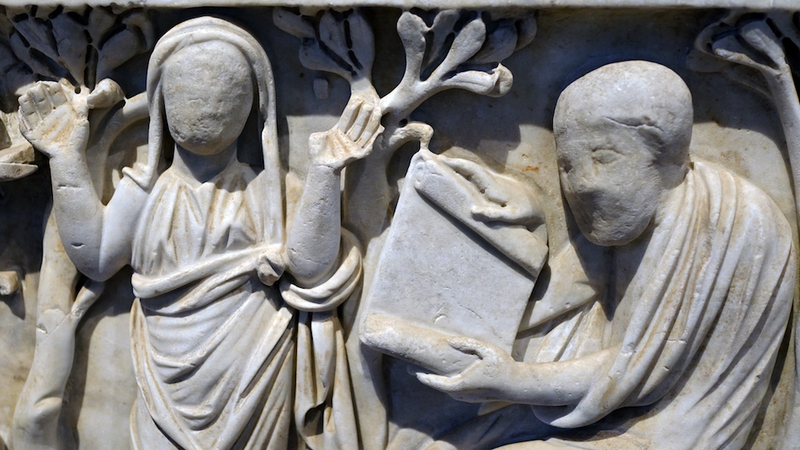 A curious detail about the male and female figures at the center of the Santa Maria Antiqua Sarcophagus is that their faces are unfinished. 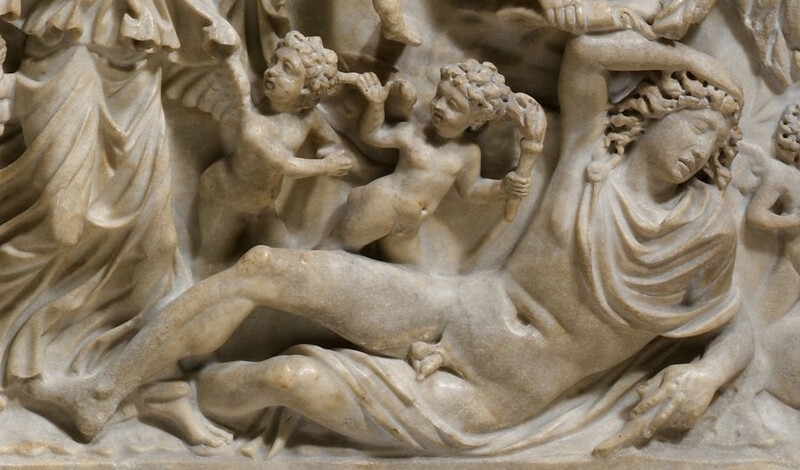 This suggests that this tomb was not made with a specific patron in mind. Rather, it was fabricated on a speculative basis, with the expectation that a patron would buy it and have his—and presumably his wife’s—likenesses added. If this is true, it says a lot about the nature of the art industry and the status of Christianity at this period. 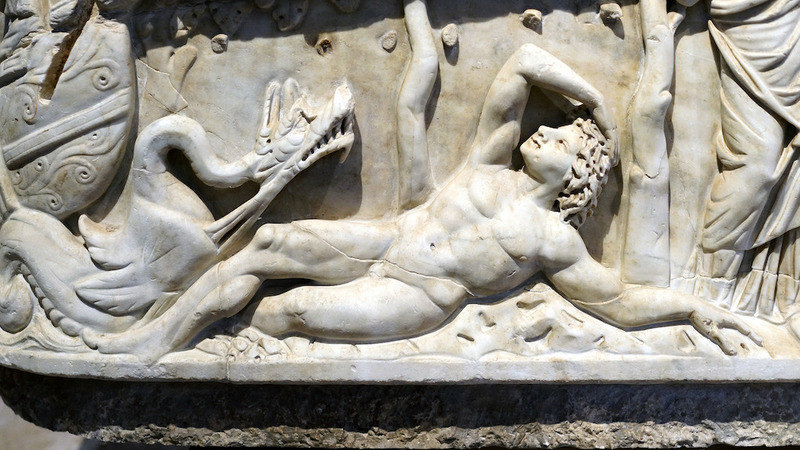 To produce a sarcophagus like this meant a serious commitment on the part of the maker. The expense of the stone and the time taken to carve it were considerable. A craftsman would not have made a commitment like this without a sense of certainty that someone would purchase it. Schmid, Werner Schmid, “Finding Sanctuary: An Early Christian Wonder in the Heart of the Roman Forum,” Icon (2005), pp. 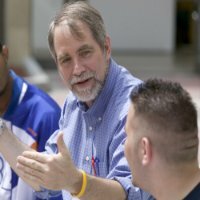 22-27.